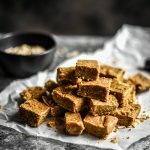 Halva is a traditional treat enjoyed throughout Europe. While many types are made with sesame, this one uses roasted sunflower seeds. Line a standard standard loaf pan with parchment and set aside. Put sunflower seeds into a food processor or blender and blend until very fine and beginning to look like really thick nut butter (but not quite). Use a spatula to scrape the mixture into the bowl of a stand mixer and add the vanilla and salt. Combine sugar and water in a medium saucepan over medium low heat and bring to a boil. Boil for about 5 to 7 minutes until a candy thermometer reads 245 degrees F. Remove from heat and quickly, but carefully, pour the syrup into the sunflower seed mixture while mixing on low speed. Mix just until combined then quickly scrape the entire mixture into the prepared pan then flatten down with spatula. Lay a second piece of parchment over top and press down firmly for a minute or two until very tightly packed. Allow to cool completely at room temperature before cutting into pieces and serving. Store in an air-tight container. If you'd like to skip the step of grinding the seeds you can try using sunflower seed butter instead. The texture will be slightly more fudgy but the flavor is very much the same. Simple replace the 2 cups of seeds with 1 cup of the sun butter.